Georgia Tech’s chamber music ensemble-in-residence, Sonic Generator, will explore open musical scores on the boundaries of composition, improvisation, and interactivity in a free exhibition and concert in partnership with the Woodruff Arts Center. The performance features music with unconventional and technologically-driven scores by Kaija Saariaho, Frederic Rzewski, Jason Freeman, Bill Ryan, David Kim-Boyle, and Akito Van Troyer. It takes place at the Rich Theatre at Woodruff Arts Center on January 24th. The exhibition opens at 7:00 p.m. and the concert begins at 8:00 p.m. The concert features two works created at Georgia Tech’s Center for Music Technology. Tech professor Jason Freeman’s Piano Etudes invites anyone to remix short pieces for solo piano through an intuitive web-based interface. 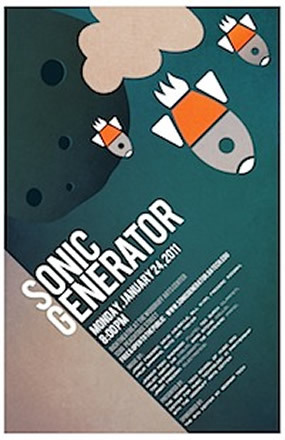 Sonic Generator’s performance will feature the winning versions from a recent contest sponsored by The New York Times. The concert also features LOLC, a project spearheaded by music technology alum Akito Van Troyer, in which the musicians of Sonic Generator perform on laptop computers, using new software developed at Tech to improvise music together by typing text.